Aprilia SR 150 scooter priced at Rs. 65,000/- | IAMABIKER - Everything Motorcycle! Owning an Aprilia is a dream for many, with bikes from the Italian manufacturer being beautiful and expensive at the same time. This meant that owning an Aprilia remained a dream for many. 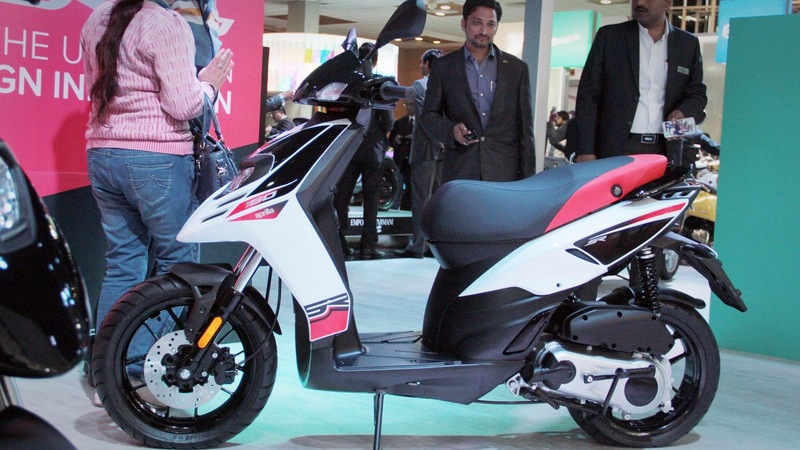 However, Piaggio group which owns Aprilia may have made a very bold move by introducing an Aprilia scooter, the Aprilia SR 150 into the Indian market. India is one of the most important markets for manufactures of two-wheeler’s. Even more important is the scooter market, which has seen more than five million units sold last year. Not only that, a staggering 20% growth was registered in the segment that is currently dominated by Honda with its best-selling Activa model. Just like they did with the revived Vespa line of scooters, Piaggio will be positioning the Aprilia SR 150 as a premium scooter for the discerning customer. Given Aprilia’s racing history, the target customer base will be the youth who want a stylish scooter with a good brand image. As most scooters currently on offer are designed with little flair or looks, the edgy styling of the Aprilia SR 150 could very well be a great crowd puller and find favour among the urban youth. The Aprilia SR 150 is a crossover scooter that has the handling dynamics and sporty ride of a sports bike with the ride comfort and sensible ergonomics of a traditional scooter. The brand new scooter has been designed and engineered in Italy while it will be produced for the Indian market at Aprilia’s Maharashtra plant. The Aprilia SR 150 is being offered at an introductory price of Rs. 65,000/- (ex-showroom). Surprisingly, that is lesser than the Vespa 150 available from Piaggio itself. The premium scooter will follow the styling and design language of the very striking super-bike siblings in Aprilia’s stable. The Aprilia SR 150 is powered by a single-cylinder 150cc, 4-stroke engine that is said to put out about 12 hp which is much higher than the competition. The Aprilia SR 150’s is lighter than the Vespa even though it is based on the same platform. The new premium scooter will also have large 14-inch wheels with five spokes, just like Aprilia race bikes. The Aprilia SR 150 is expected to go on sale next month in August.